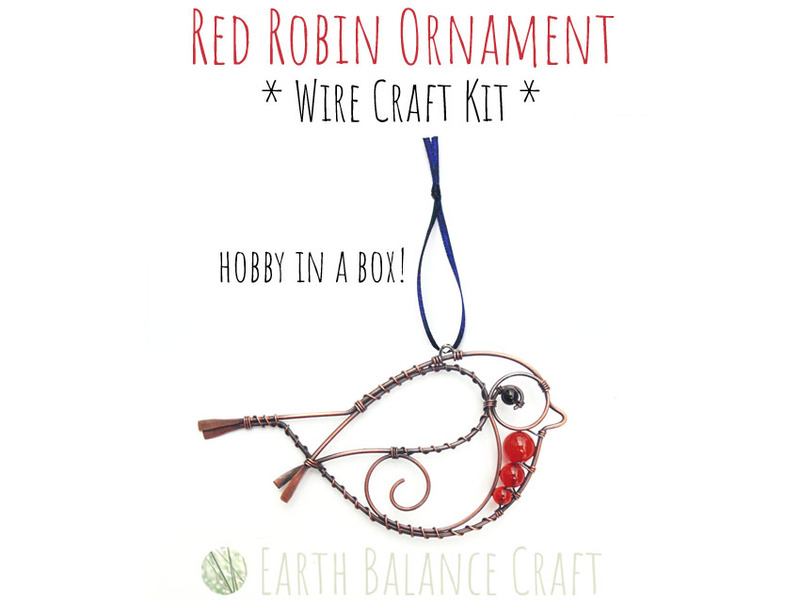 Learn to make a little robin red breast hanging decoration from titanium metal wire and gemstone beads. 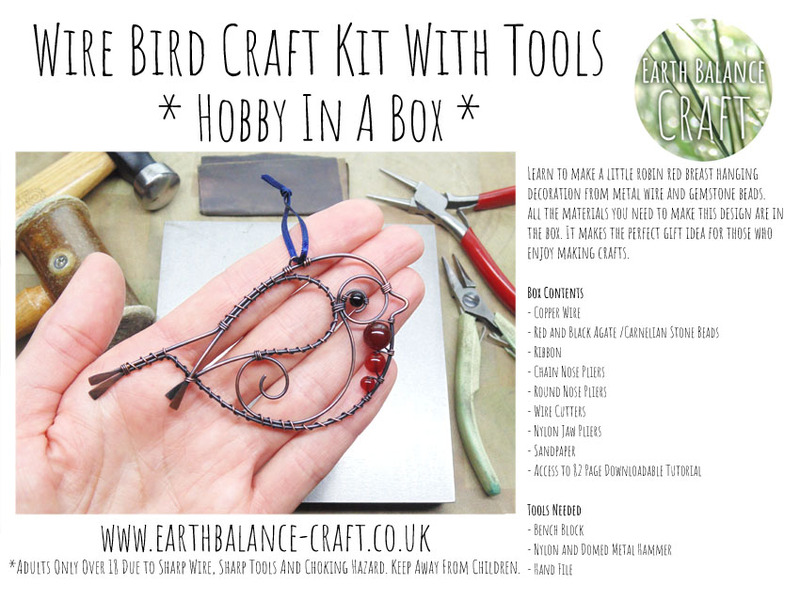 This hobby in a box makes the perfect gift idea for those who enjoy learning new crafts. 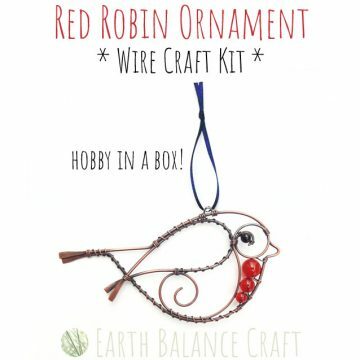 The box contains a wire wrapping starter kit with all of the materials you need to make this sweet hanging bird ornament. You are also provided with set of four wire working tools, which will help you handle and form the titanium wire. 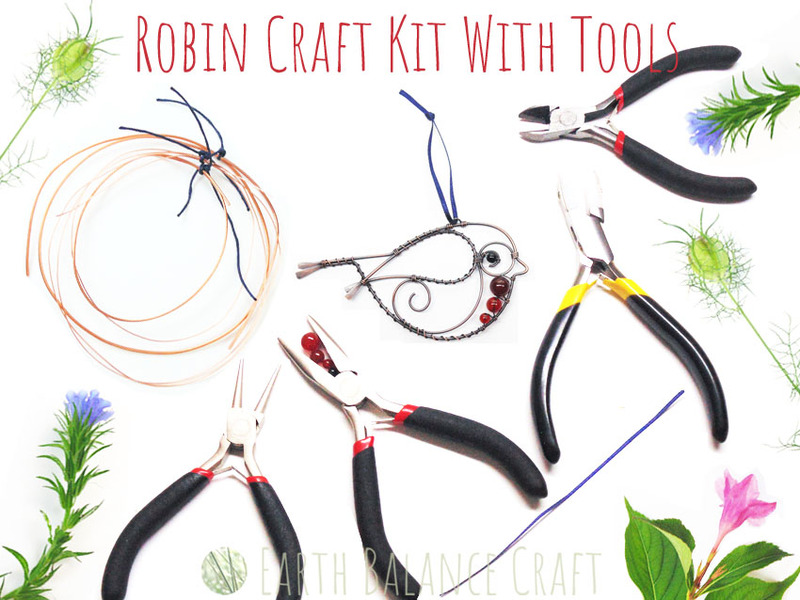 Some additional tools are needed as it is not possible to provide these in the kit. 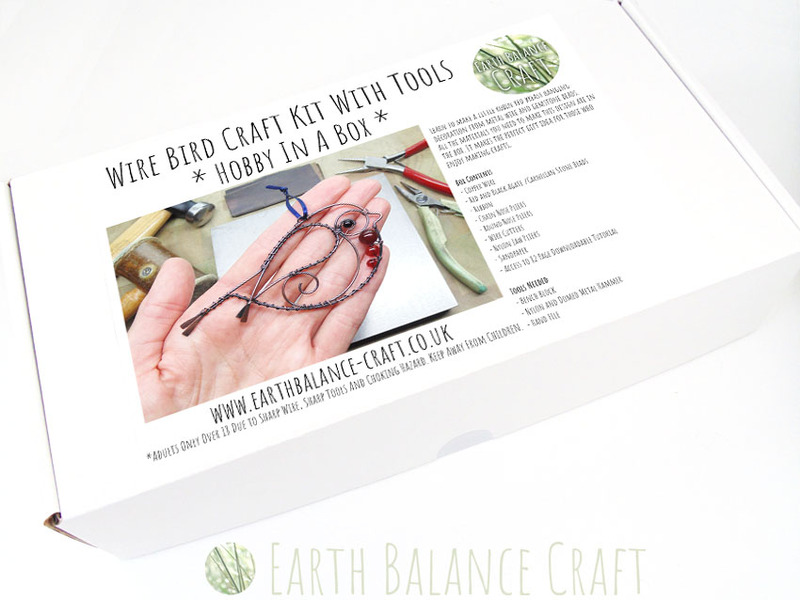 Where possible alternatives have been noted in the tutorial, advising how to use bits and bobs from around the house as a wire hack! The box will be posted out in a jiffy bag, so that the white box becomes part of the gift itself. Each of the materials and tools provided within the box are wrapped and labelled, which creates an exciting unboxing experience like opening a treasure chest of goodies! Please let me know if you would like a gift message included. Level: Suited to beginners with no experience of wire work. Dimensions: From the tail to beak is approximately 9.5cm / 3.7 inches. Tutorial: Inside the box there is a welcome letter with a unique code to access the 65 page downloadable tutorial. You will need access to the internet to download this .pdf file from dropbox. 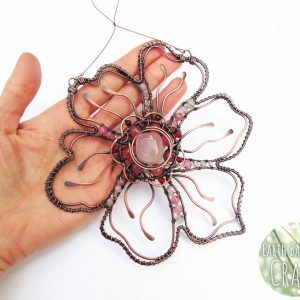 The tutorial goes through every stage of the making process from start to finish with professionally lit photographs to help guide you through making the complete design with ease. 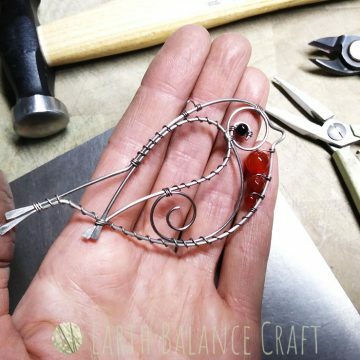 The wire work techniques to make the robin are easy to learn and easy to use in other hobby projects. 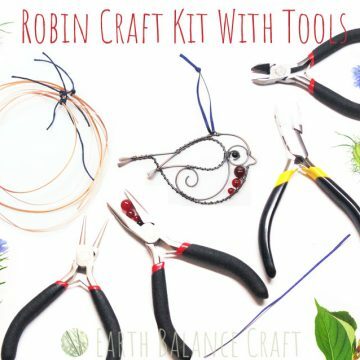 DIY alternatives to these tools are noted in the tutorial, where possible an everyday object can be used. 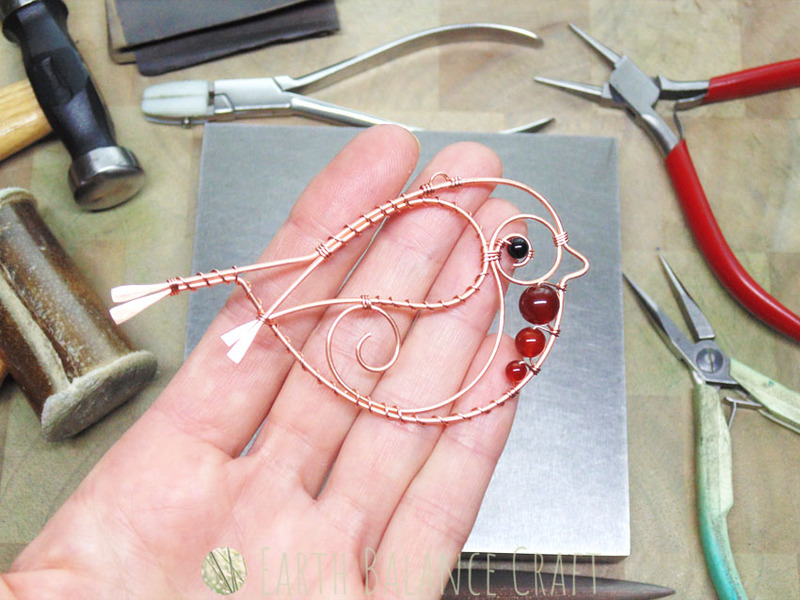 Visit this link to purchase the copper wire work tutorial for this red robin decoration. 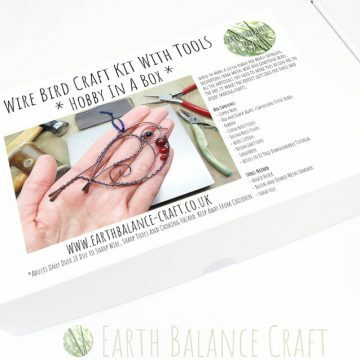 Copyright: This craft kit is copyright of “www.earthbalance-craft.co.uk and Earth Balance Craft”. Any redistribution or reproduction of part or all of the contents in any form is prohibited. This kit is for personal use only and is not to be reproduced for any educational or commercial purposes. © 2018 www.earthbalance-craft.co.uk All Rights Reserved. Disclaimer: This tutorial is written in English, for English readers only. The instructions use the UK metric system of measurement in CM. There is a conversion guide at the beginning advising on measurements in inches for USA/Imperial. The perfect decoration for yule and festive celebrations. 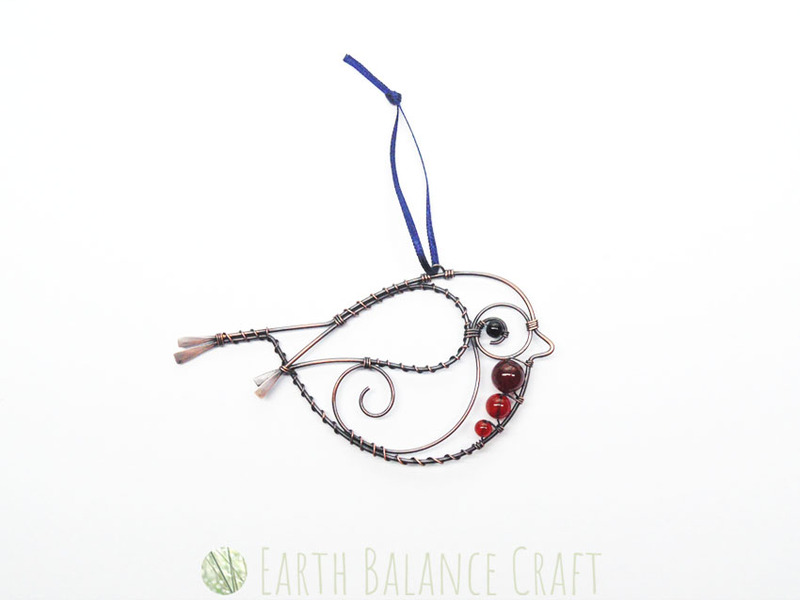 This whimsical hanging decoration is of a little robin red breast with his bright red breast and plump tummy. 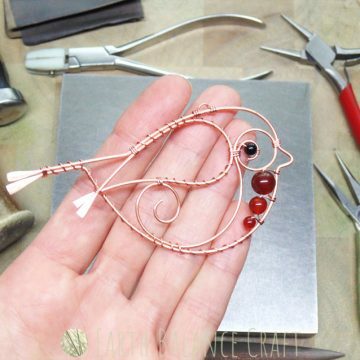 Hand-crafted with wire and red gemstone beads. He can be hung as wall art or as a window decoration, and loves a Christmas fir tree. This is part of a collection which celebrates the beauty of British garden birds. 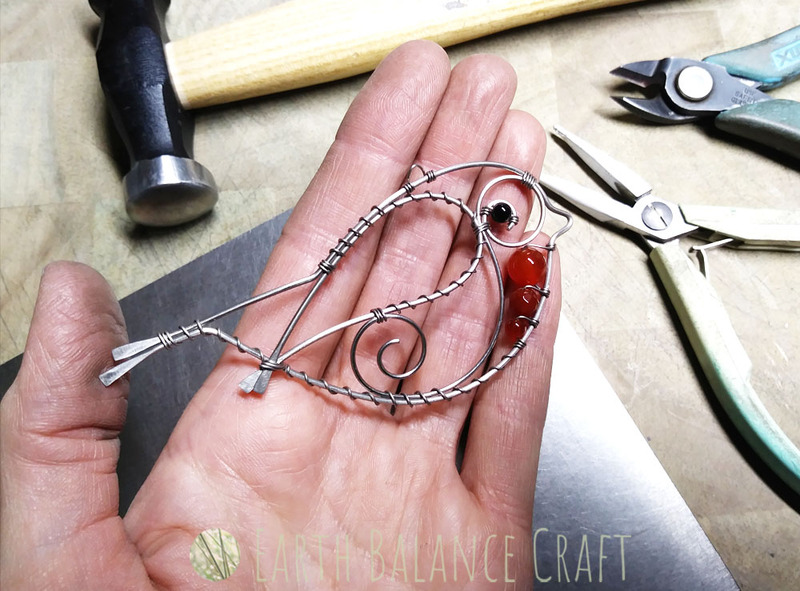 This pretty necklace design follows the beautiful curvy contours of the little red robin feather, with his red orange chest and soft downy plumage. He’s my favourite British garden bird of all. The design is hand-made with oxidised copper wire work, adorned with semi-precious gemstones that create a real statement jewellery piece. The style is intended to sit below the collarbone, delicately framing and drawing attention to the décolletage. The copper tones complement pink skin tones perfectly, with droplets of subtle colour that symbolise the robin red breast. A polished and weathered copper bookmark with three woodland droplets of jasper, agate, fluorite, labradorite and prehnite gem stone beads. Inspired by our ongoing love of the depths of the forest, with earthy tones and textures that are grounding and nurturing. Whether for a gift idea or a treat for yourself, join the traditional book lovers revolution and mark your paper pages with style! 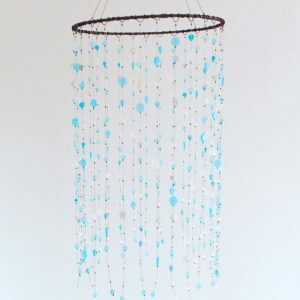 This sparkly window chandelier loves living in the sunshine and is inspired by morning dewdrops. Hand-made with an oxidised copper metal droplet frame, wrapped with an abundance of watery greens, blues and crystal clear semi-precious gemstones and glass beads. 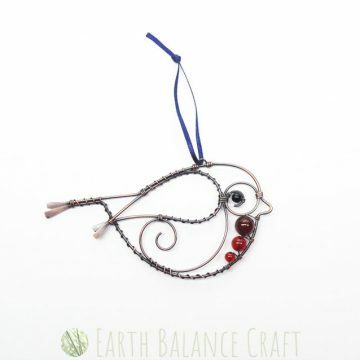 Bring flashes of pretty twinkling light into your home or garden with this ornate hanging decoration.